I started something new, something small to knit in the car, because we always travel a lot around Christmas (both our parents live in another part of the Netherlands, luckily quite close to each other). It’s Citron from Knitty, with a yarn that has been far too long in my stash: Malabrigo lace in Quarzo (lavender-purple). 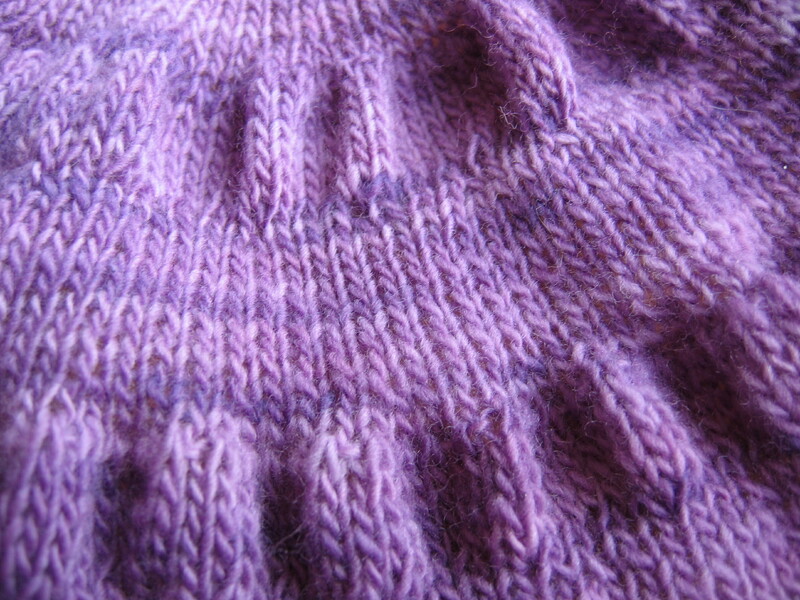 I am so glad I started this, it is such a nice knit. I have never knitted a shawl in a circular shape, so I had great fun with the beginning of the shawl. You have to knit a small strip, and then pick up stitches from two sides of that strip. The shawl goes really quickly, I am already at the fourth repeat now, and the shawl has five plus a ruffle. Those last two repeats will go slowly, I now have 348 stitches on my needles, but it doesn’t bother me because I know I am already halfway there. This shawlette is a great hit on Ravelry, and I can see why. It is easy, but very beautiful in an understated way. And it is lovely to knit. It reminds me a bit of Trinket from Kim Hargreaves, I am thinking about knitting that one too, in the brown Malabrigo I also have in my stash. The original is knitted in Rowan Kidsilk, but why not knit from stash for a change. The Malabrigo is also helping in making this such a fun knit. It is very soft and smooth in your hands. It is a semisolid, which gives really beautiful but subtle colour changes. It is not too thin, so it is easy to knit. I had originally bought it to knit a Clapotis, but I don’t really care for that design anymore. Knitting a shawl in this shape is so much more fun than knitting a rectangular shawl. I am really looking forward to knitting more shawls like this. 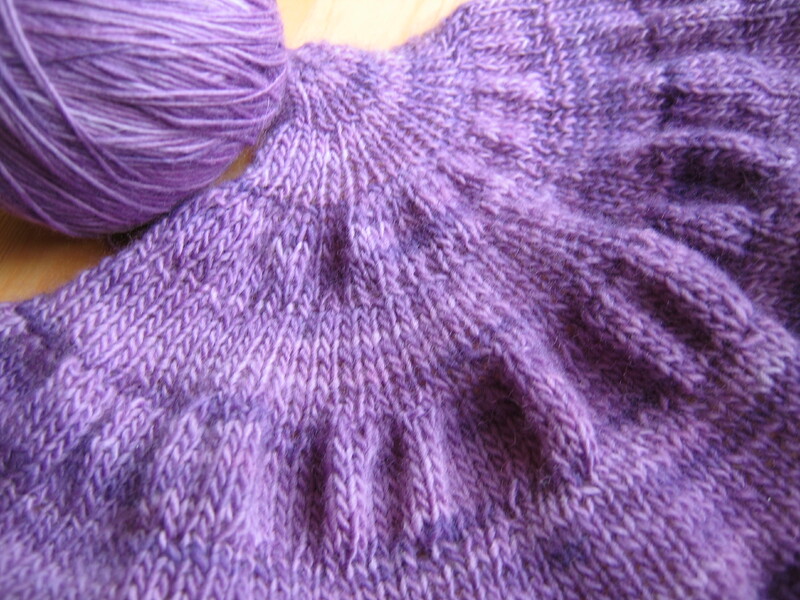 I bought the digital version of Ysolda Teague’s Whimsical Little Knits 2, and I would love to knit Damson from it. It is knitted in Malabrigo sock in Eggplant, and I would very much like to knit it in the exact same colour, such a beautiful dark colour. Perfect for me. I have seen it somewhere in a shop, but they don’t have it in stock at the moment. I am probably not the only one wanting this colour! Ysolda’s booklet is very very lovely. Full of luxurious little accessories. They are girly, flattering, but there is also a bit of humour in some designs. A very interesting designer, I am looking forward to starting my first Ysolda. I am already thinking about what yarns to use. She is a Scottish designer but uses a lot of american yarns, which are for me a bit expensive to buy because of the shipping costs. But I like thinking about subs, and because so many people on Ravelry have already knitted this patterns, I can see what yarns they have chosen and how it turned out. Hello! I came here through raverly, and found your beautiful shawl. I would like to make this myself, but since this is my first shawl ever I´m wondering how long the circular needles should be?? What kind of needles you´re using?? The circular I am using is 80 cm long, that would be about 31 inch. 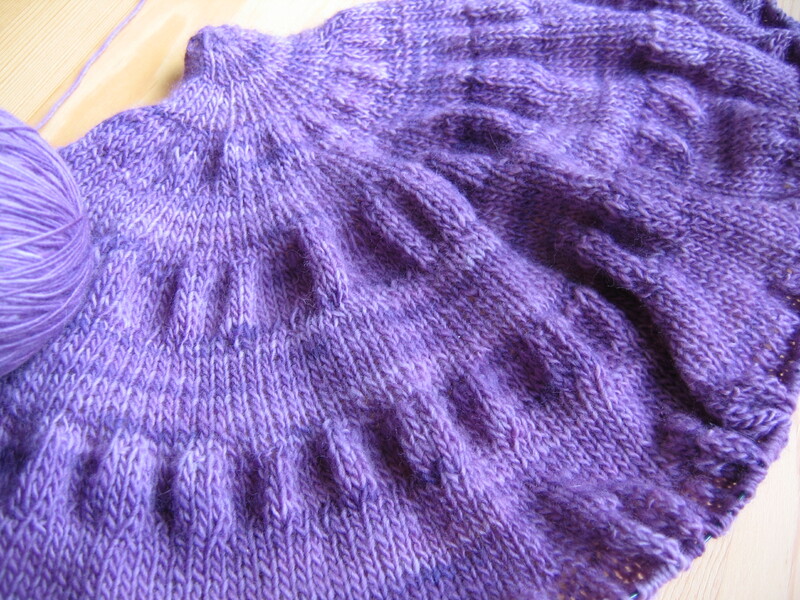 I am now working on the last ruffle, and the whole needle is full with stitches, but they are still managable. Good luck with your shawl, it is a very nice pattern to knit! This is a very beautiful piece and the color you choose made it prettier. How am I holding this work and where do I put the needle for the next stitch??? I’ll try to explain it to you. You have to turn your work 90 degrees, this means you have to pick up stitches from the left side of your work. You pick up 3 stitches there, I did this with a crochet hook, I find that easiest. After that you turn your work again 90 degrees, that means you have to pick up stitches from the bottom of your work, from the cast on edge. After that you can just knit on with 9 stitches on your needles. There is a tutorial about picking up stitches on Knitty.com.